Thank you for all your additions and personal examples of what constitutes abusive behavior. I have been very sick this week and unable to work so I haven’t been able to comment, but I do want to add just a few more thoughts. I think it’s important to make a crucial distinction between an abusive incident (one-time bad behavior) and an abusive relationship. A one time abusive incident such as verbally exploding in cruel remarks, throwing something in a fit of rage, pounding a wall, driving like a maniac, or even slapping, pushing or shoving or worse might be done by any one of us if sufficiently provoked, under the influence of drugs or alcohol or personally in a bad place. And the resulting consequences of such an abusive incident might permanently damage the relationship. However, when a person acts in such a destructive way, if he or she is mentally healthy and spiritually mature, he or she will take responsibility for his or her abusive behavior. He/she doesn’t blame others or make excuses and doesn’t minimize the damage on others or invalidate their fears. Instead, he or she repents and shows change by making amends for the damage that was caused, AND does whatever it takes to not repeat this kind of behavior in the future. When we look to define an abusive relationship, what we are looking for are repetitive patterns of behavior that result in tearing someone down or inhibiting another person’s growth. Patterns of behavior that demean, deceive, dominate, degrade, or dismiss the feelings, needs and thoughts of the partner. When we look at one single incident of sinful behavior we may believe, “This behavior isn’t that bad, so what’s the big deal?” But like 1,000 bee stings, over time, when the behavior doesn’t change, the damage becomes more and more destructive to the individual and to the relationship. Therefore, let’s be very careful (especially those who tend to be wary of the term “emotional abuse”, or neglect or indifference) not to minimize the damage of repeated incidents. This is true when even at face value, the actions may be more covert, or hard to define as abusive. When they accumulate, the damage becomes apparent. I also thought it might be helpful to remind you how we should look at this subject biblically. Abuse of any kind is always sin. Malachi 2:16-17; Psalm 11:5; Colossians 3:19 Abusive speech or behavior is never an acceptable way to communicate, even if it’s very effective (Colossians 3:8). Abusive behavior is never an appropriate response to being provoked by someone else. People provoke us all the time but we are still responsible for our response (Ephesians 4:26; Luke 6:45). When Moses was provoked by the Israelites sin, God held Moses accountable for his temper outbursts. Biblical headship does not grant a husband unlimited power over his wife, the right to remove her choices from her, or the right to have his own way all the time (Mark 10:42-45; Ephesians 5:1,2; Eph. 5:21-29). Therefore, how does a Christian respond to abuse when it is in an intimate or personal relationship? The apostle Paul encountered some spiritually abusive leaders in 2 Corinthians and he teaches us not to put up with it (2 Corinthians 11:20). He also encourages us in Romans 12:21 to not be overcome by evil, but to overcome evil with good. Below are biblical guidelines that help us understand how to respond to the evil of abuse with good. It is good to protect yourself from violent people. (Proverbs 27:12; Proverbs 11:9) David fled King Saul when he was violent toward him. The angel of the Lord warned Joseph to flee to Egypt with Jesus because Herod was trying to kill him. Paul escaped from those who sought to stone him. It is good to expose the abuser. Stop pretending all is well when everything is rotten underneath. (Ephesians 5:11) Bringing the deeds of darkness into the light is the only way to get help for both the victim and the abuser. It is good to speak the truth in love. (Matthew 18:15-17) When someone grievously sins against us and will not listen, it is good to bring the matter before the church for additional support and authority. It is good to allow the violent person to experience the consequences of his or her sinful behavior. One of life’s greatest teachers is consequences. God says what we sow we reap. (Galatians. 6:7) A person uses violence at home because he gets away with it. Don’t continue to allow that happen. (Proverbs 19:19). God has put civil authorities in place to protect victims of abuse. The apostle Paul appealed to the Roman government when he was being mistreated (Acts 22:24-29). We should do likewise. Sadly when many women appeal to their church leadership, instead of being supported, they are told to pretend. They are encouraged to put up with it for the sake of the gospel, for the sake of the marriage. This is never appropriate counsel. Lying to protect the guilty never gives God glory. As we look at the entirety of Scripture, we never see God endorsing the misuse of power over another individual nor does he give a husband power to misuse or mistreat his wife. On the contrary, we see the opposite with the apostle Paul urging and cautioning husbands not to misuse their physical power or position of authority to mistreat family members (Ephesians 6:4; Colossians 3:19,21). Friends, what steps have you taken to overcome the evil of abuse with Biblical good? Leslie, I hope you are feeling better. Thanks for another good article. . . . . .counseling, prayer, forgiveness, more prayer, more counseling, etc. . . . The Apostle Peter says: “It is God’s will that by doing good you should silence the ignorant talk of foolish men” —We overcome evil with good when we stop battling our spouses and respond to wrongdoing in ways that are godly, righteous and loving. —And it is so good for us too and much easier on our hearts. . . . .Do I want to be right, or do I want to be in relationship? Because you can’t always have both. You can’t cuddle up and relax with “being right” after a long day. . . . . For the bigger abuse, in general, —I think, and I say this mostly to myself, we would rather die than forgive (—forgive, NOT stay with monsters). It is THAT hard. If God said in plain language, ‘—Aleea, I’m giving you a choice. Forgive your mother, or die,’ I really think I would go ahead and order my cofﬁn. I am United States, Exhibit A on this. Why forgive (—forgive, NOT stay with)? b) Emotionally, we get “stuck” in stages of grief such as anger, bitterness, et.al. c) Healing, comes only through forgiving. If we are going to “move on”, we must learn to forgive. Oh my. . . . intellectually knowing all that talk is so easy: The whole New Testament in one word: ἀφῆτε —“you forgive” ἄφες —forgive. . . . .doing it when your abuse was horrific, —totally, completely different. I have a tendency to intellectualize the process —I think about what I need to do. I think that because I thought the thought, I am done. The thoughts only become real through feelings and actions. Forgiveness is part of the grieving and mourning process. I know I fear my mother will hurt me again if I forgive and I push her away for protection but that is not forgiving. I also fear becoming enmeshed again, if I forgive, she will have power over me again. We are sinful people, forgiveness is all of God. . . . . We either forgive too quickly (—just as bad) because it minimizes what was done to us. . . .“it wasn’t so bad” —when, it WAS that BAD. They did the best they could. NO THEY DID NOT. . . . . I am all over the place. Sometimes taking the blame on myself “I deserved it” other times just not forgiving at all. Forgiveness is such an “unnatural act” everything in me says don’t be a fool. I guess I feel it belittles my own suffering but the looking for retaliation, blame and pain only hurts us. Releasing those who hurt us, as Christ did, because they did not know what they were doing (—I just feel like my mother DID know what she was doing!) If we release them, they can no longer have power. Aleea, Thank you for making me smile!!! Severe hurts in life go so deep. Sometimes, ongoing relational hurts bring me back to those historical moments of betrayal and wounding and I RESPOND with a similar degree of woundedness. The journey of going forward is so much work. This post was something I needed today. I can sometimes lose hope in the struggle. Tools are helpful. God is for us. Thank you for this site! The enemy is after isolation and destruction, sometimes I have to fight with everything against that message! . . . . .Leslie, I have certainly been praying for you and everyone that puts their “name” on this blog. . . .I really believe that God shapes the world by prayer. Prayers live before God, and God’s heart is set on them. Prayers outlive the lives of those who utter them; they may even outlive an age, outlive the world. The wonderful thing about prayer is that it doesn’t require any special skills, qualifications, it is perfect for me. Re:“The journey of going forward is so much work.” . . . .Penny, oh, how I know. . . . .I need Christ just to get across the street many mornings. My spirit so weak and weary —too many hills to climb, —too many battles to fight. . . . .We all need overwhelming encouragers, exceptionally patient, incredibly tolerant, true, safe, judgment-free zones. . . . .That is how we get a new revelation of the King of Kings. . . . Just by having someone reflect the love of Christ (Truth & Grace). . . . .Praying, caring, loving, sharing. . . .That is the power of the cross. That is why Christ came, period. The rest is legalism and a whole lot of misogynistic, xenophobic people trying to control others instead of an all-loving, all-moral God and Jesus. . . . I’d rather be weak, the parts of me that used to think I was different or smarter or whatever, almost made me die. You are so right, recovery can take place only within then context of relationships; it cannot occur in isolation. When I think of responding to evil, I think that it is very easy to be tricked and not realize evil is at place. When one’s abuser learns what makes you respond it is often something so close to the truth that we begin to doubt ourselves. In response to the question, sometimes the best way to respond to evil is to not let the abuser isolate you. Satan likes divisions. Keep good relationships alive, trusted friends are usually a much better judge of our character. Of course forgiveness can set us free, yet we need to be sure forgiveness is not enabling. Leslie, praying for you. Rest and be well. You are so precious to all of us here. Your counsel and wisdom encourage me so much! I have found this journey to be a ‘severe mercy’. If life would have gone the way I dreamed of, I would be so judgmental of others and wouldn’t be able to empathize and understand others’ pain. I would not have searched the scriptures near as much and learned what is really there, how the heart of the Father weeps for His broken-hearted. When I cried out to God over and over, when I determined to thank and praise Him not only in the situation, but for it, I realized that He was being merciful in His way for His higher purposes. He guided me to the books I needed, the websites, the Boundaries book, and the online free course, “You are a Target”. Without the two husbands I would not have known how to speak into the lives of the hurting. I’m angry at them and Bill Gothard, but am also pretty sure that if they weren’t there, I would have fallen for something/someone else similar, because my belief system was wrong. The Bible says that the poor are rich in faith. My children and I learned to pray for what we needed, physically and spiritually. What I’m saying is that I believe that all this was a tearing down of real and potential idols in my life, learning who I am in Christ, how big God is, and how important that we support each other. Would I give that up? I don’t think so. Thanks to everyone who is brave enough to share here, and to all the leaders who have come out to give us wisdom and knowledge. So many dear people here to pray for, who needs another prayer list? Thanks for sharing how God even uses evil things to help us grow stronger. Praying rest and healing over you, Leslie!!!! Thank you for blessing us, again, with your insight!!! Last evening, I believe the Holy Spirit gave me the way and words to address a very difficult situation. My H was implying that he was suspicious of an affair–although he wouldn’t come out and directly say it. I asked him what gives him cause not to trust me. He insisted that he does trust me….but is unsure about the other person. I asked him what he thinks will happen, and he didn’t want to answer right away…….then he came back and told me that he is afraid that I am so starved for good relationship and this other person is so good at treating others well that something will happen before I realize it’s happening….. It goes without saying that I am cautious in my relationships with others and careful to do nothing unseemly. This time, I also did not to reassure him of my faithfulness, as my track record speaks for itself and it is up to him whether he will believe that and trust me or not…….. I have recently connected with some friends who have been extremely helpful in bringing me up out of the depression I have fallen into. They also give me a reprieve from the negativity I experience from him. (They are a married couple about my parents’ age….) H has become jealous of the time I spend with them, to which I reply: When you make it fun and pleasant to be around you, and make me smile and laugh again instead of feeling depressed, you may enjoy the privilege of my company again!! For now, I am doing what is good for my health–for my sake, AND THE CHILDREN’S!!!! At this point, I am SO GRATEFUL that God has brought good people into my life, and that He is faithful to direct my tongue when such difficult encounters come up!!!!! Survivor, wow! I wish you had been with me over a year ago; the very same situation happened with my husband, with him being jealous of my (emotional) closeness with a male friend, and using his shortcomings as a husband to accuse me of “getting it elsewhere.” I wish I had known what to say; in the event, I was so heartbroken and furious that he would think that, that I was just incoherent. It occurred to me later on that this scene was contrived to teach me two things: not to have friends (particularly male friends; for a while I was afraid to even talk to a man unless my husband was there); and not to try to communicate with my husband about the problems in our relationship, since it would only get thrown back in my face as evidence (or at least implication) of infidelity. This makes me panic a little just thinking about it. I am aghast and creeped out that there are other men out there using the same tactics. Has this exchange led to any further soul-searching on your husband’s part? Elizabeth, I am so sorry for your experience!!! I know their tactics are downright crippling!!! I lived that way, too, for about 10 years….. I lost a lot of friends because I allowed him to convince me that they were hurting me in some way or another. Over the last year or so, I have just been in awe of what God does for me in these situations!! Truly, He is my Advocate!!!!! As for whether or not he has done or will do further soul searching as a result…..only time will tell……I have had interactions with him before where I thought that progress was made in the conversation, but it never translates into real changes in life….. Right now, I am just thankful that our Father kept me from playing the game and getting caught in his trap again!!!! Survivor, You’re doing a great job responding well. It’s interesting that your husband knows what he’s doing wrong, and yet does not want to put in the effort to change. Do abusers/narcissists generally do what they know they could do to save their marriages and family????? No no no. They know because they’ve been told. They choose to not change- knowing they could. It took me a long time to digest this. They are not in the dark. They choose to look like they are. Robin: “They choose to look like they are (changing).” SO WELL SAID!!!!! I have said over and over and over again that the only thing that counseling did for him was give him more tools to LOOK like he is changing!!!!!! I just still get caught up in the HOPE for change……and it makes it really hard to leave….. Listening for the Spirit’s leading…if He says “go” I will go……. Survivor- the hardest day of my life was choosing to stop waiting for a sign–and walk in the Truth I knew. I will never say it’s easy to walk away from the commitment you made to your spouse. But had I known how well God would guide my steps as soon as I took that choice by faith– I would have done it much sooner, and saved my family years of pain. And you are so right- counseling only gives an abuser tools to use against his spouse. Keep on growing and trusting in the One with all the answers !!!!! Robin, survivor’s husband seems to know that he’s doing wrong, yet doesn’t want to change. A lot of people blame others and won’t admit wrong doing. Some may truly believe they are not at fault. Some may know they are wrong, and not want to change so they blame. Maria, yes there is a lot who blame and push off responsibility. I think you missed my point. They know what they are doing. The night before I filed, my husband asked me questions pointing to his knowledge that he knew exactly what he does. He also made it clear he was who he was. I am not blind to the fact that these kind of men know than they let on- and refuse to do what is needed. 2. There are others who believe that since the Bible tells women to submit, and also says men are the head, it is their right and believe their role is to make the wife do the right thing. They don’t believe they are doing anything wrong. In fact, they believe the wife is wrong. I’m not trying to convince anyone of my opinion, just stating it. Survivor, Why do you think that he wants to change? From your post it is obvious he knows that he’s hurting you, yet he doesn’t want to change. In his mind, he knows that he is responsible for your, bad relationship with him, yet he doesn’t want to do anything about it. Instead, he wants you to avoid this person. It’s important to look at his actions and see if they match his words. Maria, I think what I am seeing is that he *might* want change, but I am pretty certain that he doesn’t want TO change….I’m sure you understand the difference…… Even as change goes, his desire for it only seems to run as deep as having enough change to avoid losing something that he wants…….so heartbreaking……so much I could say, but too exhausted to do so….. The reason there are times that I think he wants to change are because I am still experiencing the abuse cycle and when the honeymoon phase comes around where he acknowledges that he has done wrong, I always end up thinking there is a chance it might stick this time…..and he is willing to go to counseling, which I hear many women say their husbands are not willing to do. I still don’t know if it’s a blessing or a curse that he goes…..it may just be another part of his manipulation….or he may actually be hoping for change but really doesn’t know how to go about it…..I just don’t know–and I don’t want to ‘throw in the towel’ too soon……UGH!!!!!! Survivor, I do understand what you mean. Everyone of us wants good things, but if we don’t put in the effort to get them, do we really want them? In your husband’s case, he may be doing things to keep you from leaving. If you have set your heart on him changing, and you eventually find out that he was just manipulating you all along, you will be very disappointed. Be careful, take care of yourself. At some point you may decide to separate. Do you have a plan? If you don’t, maybe slowly start formulating one. In situations like these, it’s good to have money put aside, in case you need it. Think things through so that decisions are not made impulsively. In my opinion, if a person leaves, and then has to come back, the abuse most likely will get worse. God does do miracles. But for my children’s good, I generally don’t do things they can do themselves. I think that is true for us to. Maybe the miracle is books or counseling He is providing, mentors, accountability partners. It is our responsibility to go out and get those resources. I think, in general, God does not do for us what we can do for ourselves. He also gives us free will. I think all of us can relate to that a bit. We know we’re eating too much and shouldn’t but we don’t stop. We know we should be exercising more – but we don’t. Seeing ourselves in those spots can help us have empathy and compassion for another who is also stuck in not wanting to put the effort into changing, but when our behaviors actually hurt another person, than it’s not okay for us to not want to change and yet expect the person to give us all the perks of a great relationship. . . .oh that reminds me, three weeks ago at one of the Wed. Bible studies I attend. . . . . This one tubby man snidely asked a women (recently divorced) if she had asked God to forgive her for the divorce. . . . . . .Oh no, I thought, I prayed “Lord God, please, please don’t let this degenerate into a fight.” —Not God’s will. . . That is exactly what happened. “—Yes, I did, she replied. Do you ask God to forgive you for being a huge tub of goo that abuses his body on a daily basis?” Then they went at each other until the pastor walked in. . . . . You don’t have to go very far to see many, grossly overweight people. Our bodies are not our own, and we need to work at staying fit. Being overweight is a sin. It is that simple. Our little hearts can’t take the extra poundage. We are a severely fat nation. Most do not do any sort of regular exercise and this feeds stress levels on a physical plain. It is also something that is almost as taboo to talk about in church as abuse. In fact, I recently saw a traveling production made up of obese actors who travel the world with the message that it is great to be overweight. How many obese people do you see in their golden years? Not many. . . . . . We keep ourselves in the best shape we can for God. Our bodies are not our own, and we need to work at staying fit. Instead of filing for divorce over it (—I have seen it), get on a diet and join a gym together. . . . . I always pray, Dear God if I do receive negativity, —please, I pray that it will be because I am living for Christ, not because of sin in my life or because I have mishandled your Word. . . . . . How to Act Right When Your Spouse Acts Wrong. . . . page 117 “. . . . When our desires are in conﬂict with each other, we can, by exercising our will, choose the more excellent path.” . . . . page 125 “. . . . For a long time in my Christian life, I tried to put the things I was learning into practice. I would tell myself that I would try to be more joyful or thankful, more content or self-controlled. I earnestly tried to be more patient and show more love toward others. There were times when I tried harder than others, but ultimately I always failed. I could no more my to do these things and succeed than I could try to run a marathon and ﬁnish.” . . . . I don’t know how much free-will we *really* have (re: Erasmus and Luther: The Battle Over Free Will edited by Clarence H. Miller, Peter Macardle) but the safest assumption is to exercise more self-control. . . . .But we can’t white knuckle ourselves into anything through effort. We need to beg God for “Addiction” of a different kind talked about in the Psalms: a singleness of heart, an undistracted mind. Way to display your strength Survivor!!!! You go girl!!! Thanks for the encouragement, ladies!! It’s been a rough couple of weeks and I have had a hard time reaching out. This was just what I needed today!!! That is where I was making my mistake too – I thought if my ex could just understand (if I could just explain myself better – if he could just ‘get it’ then he would change. When normal people know better we are earnest and have good motives and want to do better but not so with abusers. They are entitled and want to exploit you – Lundy Bancroft says that’s why it is so hard for them to change – because they have positioned themselves in the place of privilege and they take advantage of and use everyone in the home for their own selfish ends. When they say they want to change they are so used to the privilege and the best of everything just for them and don’t want to give it up and be a servant like Christ calls all of us to be. My ex often told me – ” I know I am a bad person but” then he would keep on being exploitive or demanding or keep on lying or cheating or rationalizing or hiding things … Even after we did bible studies together, even after we attended church together and did daily devotions together …. I needed to be hit on the head with a sledge hammer figuratively speaking but I finally figured out – not that he couldn’t change it’s that he wouldn’t change nor did he want to – why, when you have your cake and get to eat it too! Your writing has opened my eyes to the truth in the Word and has changed my life. I feel empowered to make some difficult changes in my marriage and protect my children.I am so grateful for your wisdom, insight and huge heart to help those who are hurting. Thank you. Thanks so much Heidi for your encouragement. Thanks for your prayers – all of you. I am getting better – slowly but surely. A friend of mine grew up in a house where she felt as if she grew up too quickly due to the fact that her parents were overwhelmed with their huge family. To appease her parents, she was the good girl until she went away to college. She was in her thirties when she met her husband at a bar. He was handsome and intriguing. Simply put, exciting. He told her he had nice things and that his parents were wealthy. She was attracted to him because of those things because she grew up in a poor family. However, he was divorced. He told his previous wife that he needed an apartment due to inclement weather. She found him there with another woman and so she divorced him. So, he found my friend, and they got married. On their wedding night, he got so drunk that he spent their wedding night in the hospital with alcohol poisoning. Following that, she was surprised when the back child support charges arrived, and various charges and legal fees for a sexual harassment case he had lost. He soon quit his job because he did not like it, and so they moved about five hours away from her family where she accepted a good job. He promised her he would get a reversal on his vasectomy, but decided not to go through with it. She was devasted. She sought therapy, and told the therapist that she wished she did not marry him. But she stayed married to him. He found another job, but it did not last too long. He asked his Mother to move in with them, as a means to replace the money he wasn’t providing into their family. Then, he suffered a heart attack, and decided to retire. He asked for her approval to purchase a cabin in Tennessee. She supported this to please him,but instead of only using the cabin in the fall for hunting, he moved down there. One day, she received a call from this man who knew a lot of their personal information. He indicated that her husband is with his girlfriend, and that they plan to get married once he divorces his wife (her). She was in shock, and waivered between believing him and not believing him, but yet he knew too much… In the end, she discovered her things at the cabin during one of her visits and an e-mail photo of the girlfriend where her husband to,d his friend that she is the reason why he loves Tennessee. This man has continued to degrade her, and call her foul names. Yet, he tells her he loves her? Currently, he is unhealthy, and the girlfriend isn’t as constant as she used to be. He professes his love to his wife now, and she believes him. Really? I’m confused. Then, she told me that her Church has told h that God doesn’t believe in divorce, and that she needs to love him more so as to be an example to bring him to Christ. He is a devote atheist, and views her Church as a cult. It’s a Bible teaching Church, or so is my understanding. I am so saddened, as she h shut everybody out, and even suggested that she needs to hang with Christians. I am a Christian, but one who is telling her the truth, in love. She doesn’t want to listen to me. Her Doctor has told her that this has been going on for over five years, and she needs to leave her husband. Actually, it’s been more like ten years. She wants him to love her, and has stated that he loves her as much as he can. So is this as good as it gets? Please help? Please? Some guidance? Gail, if your friend attends a Bible-teaching church, shouldn’t they also recognize the “not being yoked with unbelievers” matter? I think a common problem is when an abuser is a professing ‘c’hristian and can get members of the congregation to back him up as “struggling” with his sin (as opposed to the abuser being perfectly adjusted to his sin, which seems to be more often the case). But if friend’s h is a professing atheist, I think you could make a case to your friend that their marriage may have been invalid from the start. Just a heads up – not able to PIN. Message says it will lead to SPAM 🙁 Good points in the article – thanks and God bless your efforts! I left my abusive (now ex) husband. It will be seven years ago this April. I have overcome evil with good by being open about my abuse and working not only on my own healing but encouraging others to face their pasts and work on their healing too. Amen, Amy!! Way to overcome evil! Maria, I don’t think we disagree. I agree with both your points and have experienced both of them in my destructive relationship. I thought you were surprised when a husband who has been abusive knew he was wrong, admitted it, and still chose to not change. In my experiences, they usually do know they are wrong but feel too entitled to have to be required to change. Robin, I wasn’t surprised, it came from a place of me wondering about his character. Most people (non Christians, too) general change when they realize they are wrong and have hurt someone. I am of mind, the thought ‘overcoming evil with good’ could be deceptive. I think much depends on how you define good. 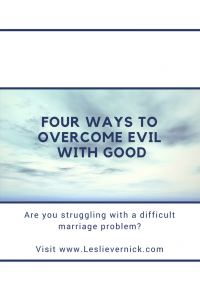 While my husband was living in our home, I found it nearly impossible to overcome evil with good. When I started applying some difficult consequences he did not see it as good. And for me it was painful to have to separate from him. The more consequences applied, the more he rebelled. Yes I did think evil was being fought with good. But unfortunately, it did not give me the outcome I desired. In the end, God said it is not good for him to continue in evil and it’s time he separates from your home. I thought the separation would serve for good and he would bend his knee in repentance. But the good was when consequences were applied, and he refused to make healthier choices- God said it is good to separate from evil. So for me good did not mean evil would cease but that I would stand up for myself and my family, and fight for Righteousness. Robin, I agree, I think there’s a big difference between been nice and doing things for other’s good. We are not called to be nice. I told my counselor this week, I have dreamed how I would like to live with my destructive ex-husband for one week. I am not who I was. Evil would not cross my front door . I would live with him with very strong boundaries. I would live with him in complete repriocity which is something that didn’t exist in my marriage. I would speak boldly on how all the things he used to bully and put fear in us if we didn’t submit too- would be allowed freely. I absolutely would love the opportunity to remove the evil and replace it with Gods Unconditional Love w/ safe boundaries. This will likely never happen, but I have grown as a person who realizes God did something very good in me, by removing evil from my home . I continue to move forward and receive healing as God leads. Robin, I have noticed growth in you-good job and keep growing. Survivor I remember well being where you are. Who doesn’t want to believe there spouse wants change? I think Henry Cloud helped me at this place- he said look at his history, that’s what your future will look like unless the abuser makes a radical change, falls to his knees in acknowledgement and repentance, and doesn’t tell you he wants change- he JUST DOES IT- HE CHANGES ON HIS OWN ACCORD. This helped me so much bro come out of a false reality . We want to see something, he only talks about.
. . . I went back and studied all those texts. . . . this turning of even the greatest evil into the greatest good, it is really hard stuff to process. . . . But it is the reverse logic that God always seems to use: The way right is left; the way up is down; the way to save your life is to lose it completely. . . . . Evil does its worst, but God takes it as the raw material by which to bless people. Bringing grace out of pure sin, you know, making use of sin to work out even more grace. . . .One thing looks clear, no human person would ever think up that way of doing things. . . . God bringing all good out of all evil, not only to overcome the evil, but to make the evil work toward even more good. . . . .”bless them which persecute you”, “recompense to no one evil for evil”, “avenge not yourselves”, “overcome evil with good”. . . . Obviously, it is to bring about reconciliation but what if my pride will not allow it and I fester in bitterness and resentment? . . . . Maybe it enacts love for the enemy (my mother) but to just dispense forgiveness without any regard for how it is received by the offender (That would be a good study). . . . I don’t, I just don’t know. And to make it harder, it sure looks like God makes a distinction between humble forgiveness that might achieve that repentance goal and covert, even unconscious, prideful forgiveness that will have the opposite effect. Survivor, I read where you said you had ‘ a hope’ he will change. That reminds me of what H. Cloud said in ‘Necessary Endings’. He said a hope he is changing, is only a hope. It requires an action to be a true reality . Robin, you are a voice of reason among a thousand conflicting voices!!! Thanks for your input and insight!!! Survivor, if I can help you untangle some mis beliefs you might be telling yourself, that keep you in destructive relationship, I want to help. I lived over 25 years or more thinking no one wants to help me. But today on the blog, we can get a wealth of wisdom if our hearts are open to it. When I read your note to Maria I heard you say you are still in the cycle of abuse where you get to experience the honeymoon phase and hope. Let me ask you a very difficult question. I know it is hard to be brutally honest with ourselves when it comes to severing ties with our evil spouse. DO YOU SEE WHAT HE IS DOING?? HE IS USING THE HONEYMOON PHASE OF THE ABUSE CYCLE TO GIVE YOU HOPE . MY QUESTION IS — ISNT THAT DECEIT AND MANIPULATION??? Survivor– GOD IS A GOD OF MIRACLES – YOU ARE RIGHT!! God also considers you and your children very precious, and when a spouse knows what he needs to do and does not do it, God calls that sin. It grieves God greatly when we allow sin to remain in our home, and even cooperate with it. I have a different belief about God performing miracles. I believe we do not limit God from a miracle, if we choose to separate from abuse. God can work a miracle – and lots of time He does as we separate from what He hates- men refusing to love and honor their wife and children. I’ve read many testimonies about men finally paying attention to what their wives are saying, after she quits participating and enabling his abuse to continue. When I left my house, I did so because I was the blame for his abuse. I knew by removing myself, he would have to alone sit in his abuse. It was necessary for me to get out of the way!!!!! God can reach a man and perform a miracle, without your help. I agree. God still does miracles, but He does not force us to change against our will. I believe that we like to be others’ savior, sermonizing and begging and crying and manipulating; and the abuser likes to use us as such, as in dumping their sins and emotional issues on us, then walking away feeling all relieved. We like to think that we can help them with that, but instead we get beaten down because we are not meant to be anyone’s scapegoat or sacrificial lamb. There is idolatry on both sides here. Proverbs says, “A word to the wise is enough, but stripes are for the backs of fools.” A fool is one who doesn’t listen to words, only consequences. If we keep absorbing the consequences of a fool’s actions, why should they ever change? What fun would that be? Connie, that’s very wise application of that scripture in Proverbs. I’ve tried twice to leave a post that was very lengthy. The first time I thought it didn’t go thru bc it was a technical glitch on my phone’s part. I tried a second time but it still didn’t work. Do long posts get kicked out? Perhaps, I said something that red-flagged those posts? If you have my two long posts from Saturday and from Sunday afternoon under consideration for release, please only post one since they’re almost identical. That’s assuming they meet the criteria for posting. Sorry for the trouble. Maybe I was too long-winded LOL. Ruth, I’ve seen some very long posts – I’m sure the length is not the problem. I think sometimes a certain word can stop it!! In order to overcome evil with Biblical good, I chose to separate after over 20 years of marriage. 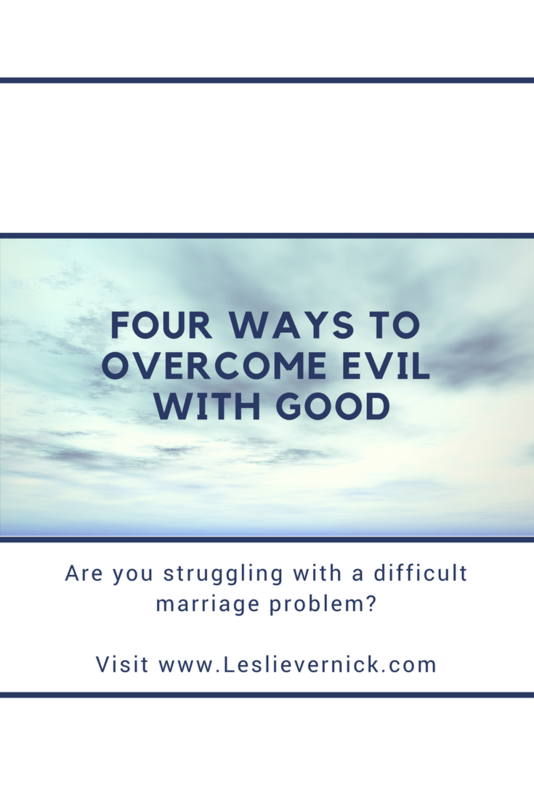 I was good at pretending and covering for sin and hiding as much as I could from the children (teens to elementary age) but things were escalating for about a year when I read Leslie’s book and faced my reality: a destructive relationship. As I built CORE strength, I stood up for myself and the children (who had been exasperated to anger and disciplined harshly without love). The result was more frustration and sin on his part. The separation was needed and took place almost 2 years ago after an emotional affair was confessed by him. The pastor of our church at the time said there was no room for separation but I could call 911 if needed. I sought much counsel and knew the kids and I needed to get out of the chaos so I found a place to go for 3 months. It took awhile to come out of the fog but it was a freedom I needed as well as peace long overdue. I was a “peace-faker” and pressed on every side by trying to keep “the peace” at a great expense. After 3 months of reprieve we returned home only to experience more chaos and I asked for separation again- this time he moved out. I’m still uncertain of our future but know better what repentance looks like and do not want reconciliation without it. He says he has changed and that I will not see it unless we are back in the same house but I do not agree. He still is upset that I insisted on individual counseling rather than counseling together. The times we counseled together were not that helpful other than to see his intent to still manipulate. I am more open to going to a marriage intensive (4 days of group counseling) than I was before – still fearful that things might sound better but not result in changed behavior. I guess only time will tell. The 17 yo is angry that I haven’t finalized the divorce, and the pre-teen does not want to be forced to go between homes. I am so thankful for this website and for the peace and wisdom from above.